This semitropical Portuguese island lying 600km off the coast of Morocco is attracting a new generation of travellers searching for something beyond the homogenous sprawl of so many holiday resorts. 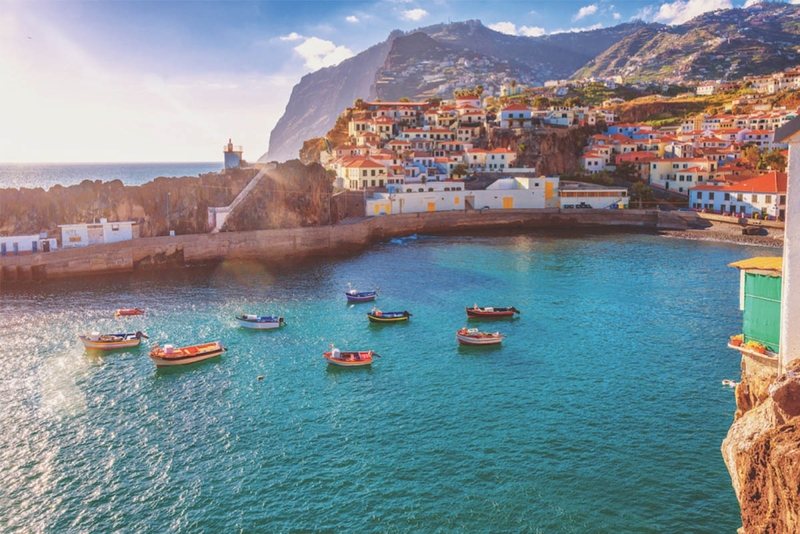 It is only a threeandahalf hour flight from the UK, yet Madeira’s precipitous valleys, sheer cliffs – including the secondhighest sea cliffs in the world at Cabo Girão – and lush vegetation offer spectacular landscapes to rival many destinations. Add in some decent local wines, worldclass hiking, an abundance of tropical plants, and fine patisserie and he attractions are obvious. You’ll fly into the handsome capital city of Funchal with its dramatic mountain backdrop and palmfringed seafront encompassing the historic Old Town with buildings dating back to the 15th century. It’s a small and compact city that’s home to 125,000 people – which is about half the island’s population. It is easily explored on foot with frequent pit stops where you can sample good coffee and cream cakes. Funchal’s exotic gardens, grand buildings (don’t miss the amazing Gothic cathedral and the handsome Baltazar Dias Theatre), bustling shopping streets and diverse eateries make it an appealing city as you can walk it all in around 40 minutes. The seafront – Avenida do Mar promenade – runs the length of the city’s beach and makes for a fine stroll beside the Atlantic, day or evening. Take a stroll through the city and you’re likely to find hibiscus, banana, oleander, agapanthus, arum lilies and honeysuckle, to name a few. The hilltop town of Monte is just a short climb from Funchal city centre. You’ll be taken up into the hills on a tenminute ride with fantastic views of the harbour. Monte is where you’ll find the famed botanical gardens and the Nossa Senhora do Monte church, which is Madeira’s prime pilgrimage destination. Shake things up and catch a ride in one of these giant wicker baskets. Catch one from outside the Monte gardens and experience one of the island’s most thrilling rides. Catch a boat from Funchal waterfront for an afternoon watching whales and dolphins. One of our favourite excursions was a sunny threehour catamaran trip – we saw more dolphins than we could count jumping beside our boat! The company also runs a charming sunset cruise. vmtmadeira.com (http://vmtmadeira.com). There’s an efficient bus network but if you want to go off the beaten track, take a tour. For reasonably priced fully guided tours covering local markets, banana and sugar cane plantations, or mountains and forests, try Green Devil Safari (http://greendevilsafari.com). We booked a 12mile guided levada walk with Madeira Adventure Kingdom (http://madeiraadventurekingdom.com) that featured two tunnels cut into the mountains. Don’t miss the Discovering Madeira’s Wine and Food English Language Walking Tour (http://discoveringmadeira.com/wineandfoodwalkingtour), a halfday adventure with nine stops including 11 food and six drink tastings, from £46 per head. We tried local foods such as honey cake, biscuits, pork and wine. For a more rarefied dining experience, Belmond Reid’s Palace (http://belmond.com/reidspalacemadeira/) is one of the world’s best and most historic hotels and the perfect spot for a stylish afternoon tea by the sea. The poolside restaurant is also a cut above with its huge selection of seafood on offer, as well as fine clifftop views to enjoy as you dine. As a final stop, Funchal’s Mercado dos Lavradores flower and fruit market is a fascinating place to find a memento of the island, with stalls selling six different types of fresh passion fruit as well as exotic flowers that can be specially packed for you to take home. The fivestar Quinta do Monte Hotel (http://quintadomontemadeira.com) and Panoramic Gardens is in the hills above Funchal, just a twominute walk from the cable car terminal and the departure point of the wickerwork toboggans. From £94 B&B per room per night. Porto Mare (http://portobay.com) in Funchal’s Hotel Zone is in a great location and offers value for money. Try to request a seaview room. From £161 B&B per room per night. The Quinta das Vistas Palace Gardens (http://quintadasvistasmadeira.com) overlooks the North Atlantic Ocean and Funchal’s mountains, an upmarket hotel in a former manor house with a restaurant, terrace and spectacular views. From £139 per room per night B&B. CLIMATE Warm and sunny all year. August is the hottest month with an average temperature of 23°C.January is the coldest at 16°C, with the most daily sunshine hours in September. The average sea temperature in September is 24°C. GETTING THERE British Airways, easyJet, Jet2, Monarch Airlines and Thomson Airways all fly from the UK to Madeira. Local buses run between the airport and central Funchal.